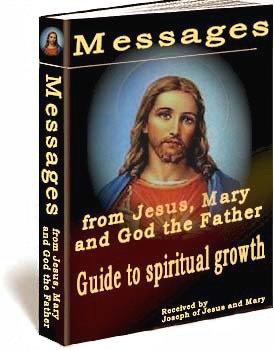 Messages from Jesus, Mary and God the Father - Download for free. Donations welcome. Have you ever heard the voice of God speaking to your heart? Have you ever experienced the peace and joy that God gives when we are truly close to Him? Would you like to feel really close to Him? Well these messages are addressed to you, they are waiting for you to read them and discover your gift as a child of God. These unique divine revelations will become a treasure for anyone desiring to grow in the faith. These 757 messages will mold the soul of anyone with a humble attitude and a desire to have an intimate relationship with God, they are a true spiritual guide that can be consulted at anytime. The spiritual life is very important part of all human beings, we must learn to depend on God more than on ourselves, unfortunately we live in a hurry and we don't spend enough time with God. We barely have time to talk to God and to ask all the things that we need. These writing will teach us how to enter into silence and listen to the voice of God in our hearts. The messages are professionally compiled with an ebook program (Click on link to see how the ebook will look in your computer). As a result the 757 messages are beautifully presented and easy to read. The program comes with a search facility and keeps track of visited pages. These messages are a beautiful gift to your spirituality, they will improve your religious motivation and your relationship with God. These words from Heaven will touch your heart and soul, they will awaken your spirit to learn to listen to God and to live in His Presence. Jesus: (message 190) I am anointing these words that I give you with my Grace and Blessings for all those who hear them (or read them). These messages are a teaching for everyone who wants to grow spiritually, they were given to Joseph of Jesus and Mary, but the Lord wants you to read them because they are for you too.